The situation in the Ukraine reached a critical stage yesterday as at least 25 people died when riot police stormed Independence Square in Kiev. Any hopes of a negotiated settlement were in bloody tatters last night as the security services moved into all out assault mode. At least 500 people were injured in a burning fit of violence as the epicentre of opposition to Viktor Yanukovych came under sustained attack. The security services had issued a stark warning to protestors, saying "Extremists are killing innocents on the streets of the capital, burning buildings and cars. Unless the disorder stops, we will have to restore order by all means envisaged by law." Viktor Yanukovych pulled back from ongoing negotiations over a new coalition government, warning opposition leaders to dissociate themselves from radicals, otherwise he would "talk differently" with them. Despite calls from Washington for Yanukovych to "exercise maximum restraint", riot police were seen firing live rounds from Kalashnikovs. 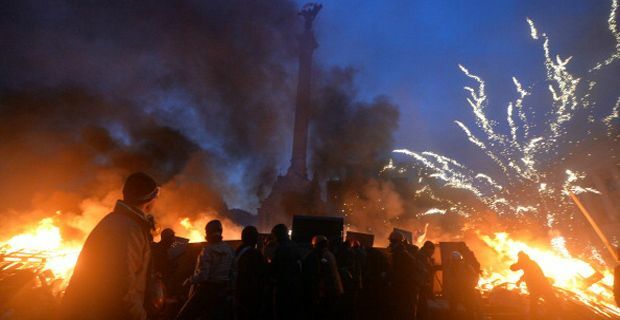 Vitali Klitschko, one of the opposition leader and former world heavyweight boxing champion, said: "The government has deliberately organised a provocation to clear Independence Square with blood and violence and to destroy the protests and the activists." “The government must immediately withdraw troops and put an end to the bloody conflict, because people are dying. I told Yanukovych this. How can we hold talks while blood is being shed?" "The violent clashes today have to date resulted in deaths by bullets and hundreds of injuries, including seven people in a critical position. Snipers posted on roofs are targeting the heads and chests of protesters. Ambulances blocked by security forces are not able to provide first aid to the injured"